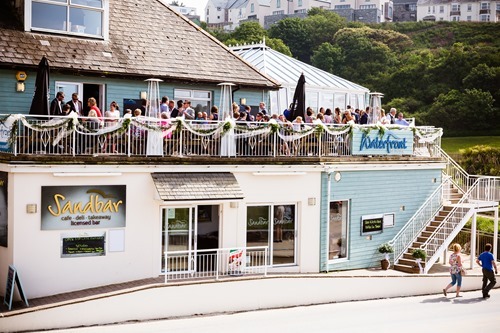 With spectacular panoramic views of Polzeath Beach and Pentire Point, the Waterfront restaurant, bar and terrace are simply in the best location to enjoy a lazy lunch with a chilled glass of wine or dinner while the sun sets. We are open all year round and have a variety of events and specials to keep you coming back. 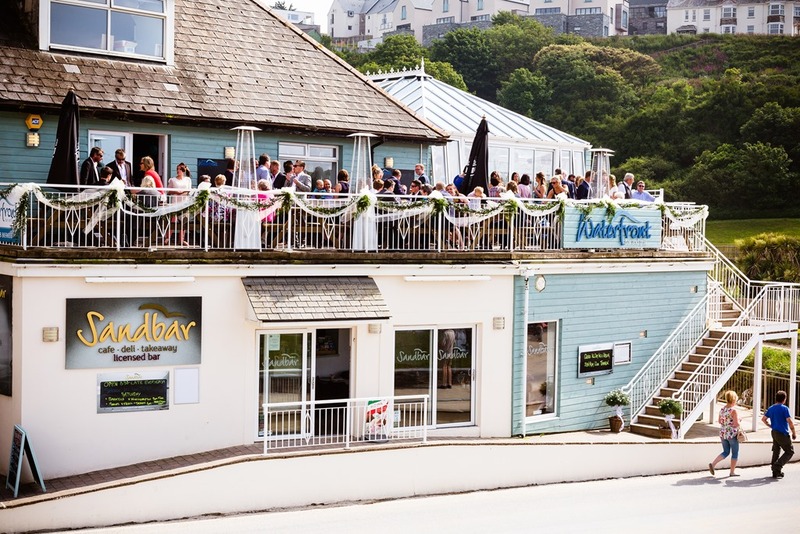 Whether you are looking for a special occasion with friends and family, Sunday Lunch in relaxed and comfortable surroundings, a romantic dinner for two or just a chance to unwind with a cocktail - The Waterfront is the perfect choice. Get married at the Waterfront with our licensed Ceremonies and wedding receptions. Private Hire of all our venues for everything from Corporate days to Children’s parties. The main restaurant offers relaxed dining inside all year round. 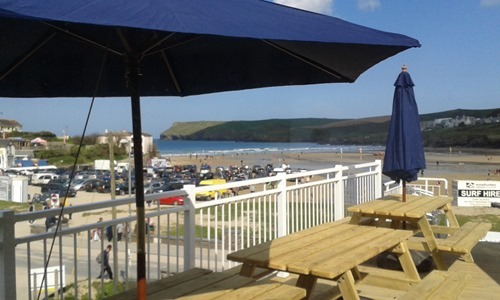 The terrace offers extensive seating for outside dining overlooking Polzeath Beach and Pentire point. 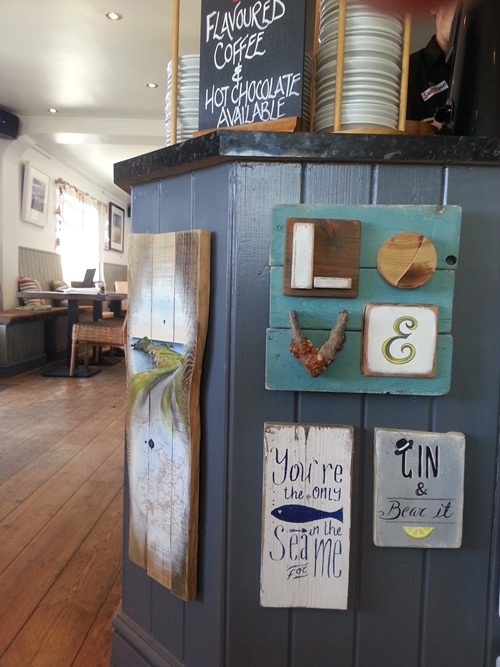 It is available all through the summer and is a great place to get something to eat whilst enjoying watching the surf. Grab yourself a blanket from inside and make the most of the spectacular view enjoying a cocktail at sunset. It is a lovely room just off the Conservatory with its own entrance making it ideal for small parties and events. 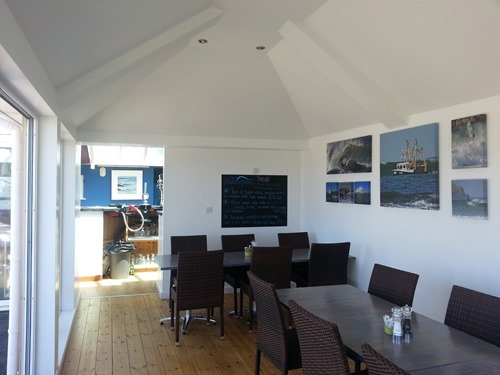 The Beach Hut offers private dining for up to 24 people. Please contact us to arrange and we can help you with everything from cocktails to a special menu. To enquire about a booking please call us on 01208 869655 and we can help you with everything from cocktails to a special menu. The Conservatory is the main area of the restaurant with panoramic views across the beach. Light and airy through the summer, but cosy throughout the winter with the log burner and the lounge area. A fantastic location for a party of up to 50 with its own bar, making it separate to the rest of the restaurant. Please contact us to arrange for your party or event. The Roof Top Bar is our ultimate chill out zone. The Waterfront offers a unique ambiance for a romantic and highly personal wedding celebration. 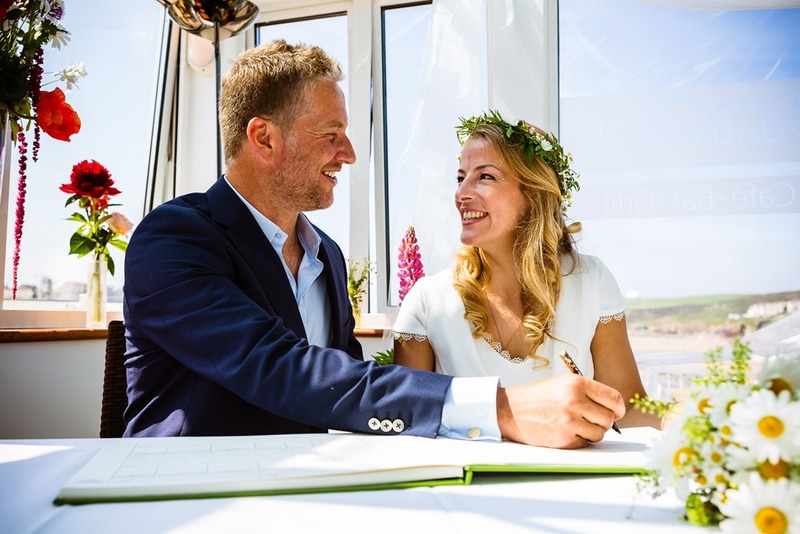 Situated in Polzeath, with breath-taking views across the beach to Pentire Point, and just minutes away to Rock and Daymer Bay, you can choose from three idyllic beaches providing a stunning backdrop for wedding photographs for you and your guests. 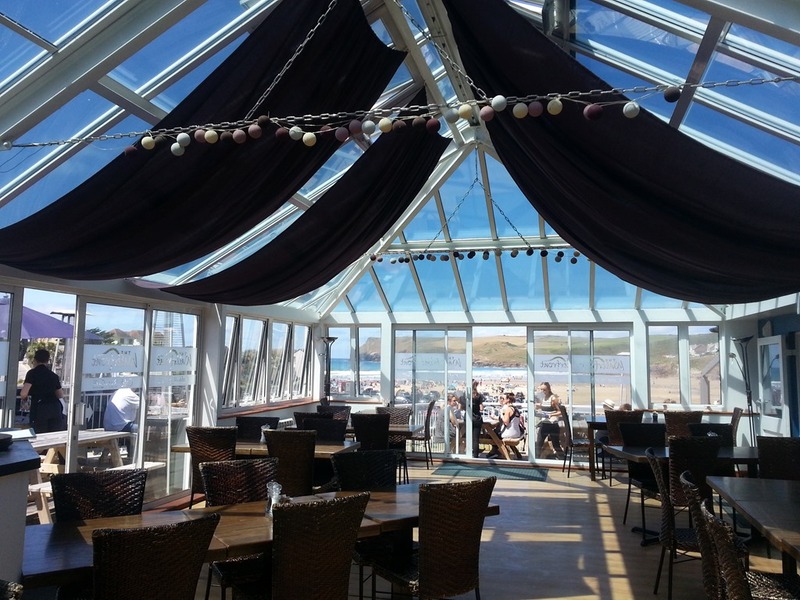 The Waterfront will provide the perfect relaxed environment for your special occasion. 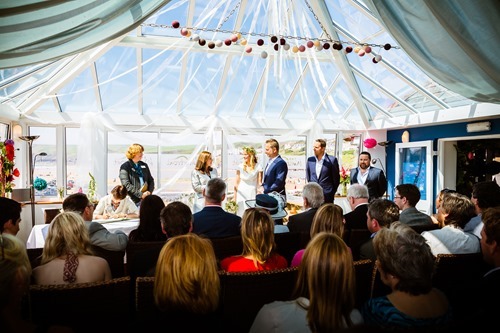 The Waterfront is licensed to perform Civil Marriage Ceremonies in two reception areas, The Conservatory at The Waterfront Bar & Restaurant and for more informal ceremonies The Sandbar. Our venues are adaptable to suit your personal requirements, with the benefit of the Conservatory having access to the outside heated terraces, perfect for those canapés and champagne. Whether you choose to hire the Conservatory or would like complete exclusivity by adding the bar and restaurant along with the terraces , we can offer a wide selection of locally sourced menu options and our chefs are always happy to discuss a bespoke package to ensure that your wedding is very special. Our dedicated team are more than happy to help with your choice, whether you want the full red carpet treatment, a small intimate wedding, help with flowers, music, cakes, photographers, entertainment or accommodation, we are here to ensure your day runs as smooth as possible. Please do get in touch with us if you have any questions or would like to arrange a meeting, we look forward to meeting you. The Waterfront and Sandbar are all available for private parties and special events. 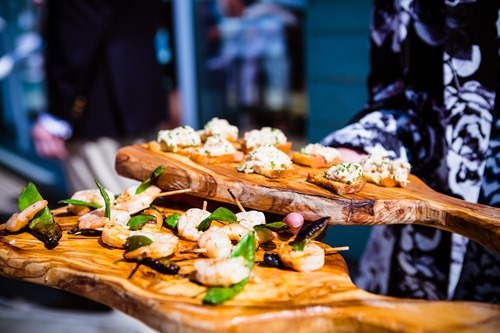 Whether you are looking for a seated reception or a more relaxed buffet style, informal parties or private candle-lit dining, we offer a full catering service and licensed bars. The terraces have parasols on those hot days and heaters for cooler evenings, so what better way to end the day watching the sun set over the ocean or estuary and the twinkling lights of Pentire or Padstow harbour. For business meetings and corporate events we can offer wireless broadband and can accommodate private meetings, customer presentations or a product launch. If you're looking for something adventurous such as water skiing, sailing, wind-surfing, kayaking, golf or surfing etc we can arrange a full package, just let us know what you are looking for! The Sandbar is the perfect venue for children's parties, it’s fun and friendly with its own pizza kitchen and we can even arrange entertainment for you if you're looking for somewhere to host fund-raising events, auctions/sales, celebratory parties and weddings, do get in touch with us and we will be more than happy to discuss your requirements.